91 mins The whistles are ringing out around the stadium. The ball falls to Henry in the Senegal box and he wins a corner. Petit takes, the ball comes to Leboeuf who fails to atone for his sins. He shoots an excellent chance straight at Sylva again. In their World Cup debut, Senegal have stunned the world champions in one of the greatest upsets in World Cup history. Needless to say, the players are thrilled. They rode their luck at times, but fully deserved their win. That's it. Their ordeal – our ordeal – is over. No longer must we support this team whose whims drained us all. Les Bleus are eliminated and got what they deserved: they were ridiculous till the end. At no point did this team show the slightest trace of a soul. France are out … the World Cup has lost its jesters. For the first time in French history, the public and the players greet an exit with relief. Jean-Paul Sartre wrote that "in football, everything is complicated by the presence of an opponent" but this French team showed you don't necessarily need an opponent – they were able to sabotage themselves. Easily beaten by a very modest South African team, Les Bleus left the tournament by the same way they came in: by the back door. After spending the weekend playing at being trade unionists and special agents, they forgot to play football. Physically and psychologically unprepared, they simply couldn't put one foot in front of the other. So can Australia capitalise on this ticking time bomb? Well unfortunately, Australia’s record in the last 3 World Cups against the top seeded team from their group is not great – 3 losses, 9 goals conceded, 0 goals scored. With this kind of record, it is with trepidation that Australian football supporters look ahead to Australia's opening fixture with Les Bleus. But when is the best time to play them? In their first match before France have found their groove? Or perhaps in the third match in the hope they have already qualified and are resting some of their star players? In actual fact, historically (since the world cup was expanded to the current 32 team format) the seeded team of a group is most vulnerable in their second game, where they have a win rate of only 55%. The record for the seeded team’s first and third matches are nearly identical, with the seeded team winning about 70% of the time. So, unfortunately for Australia there appears to be no great advantage of playing France first. 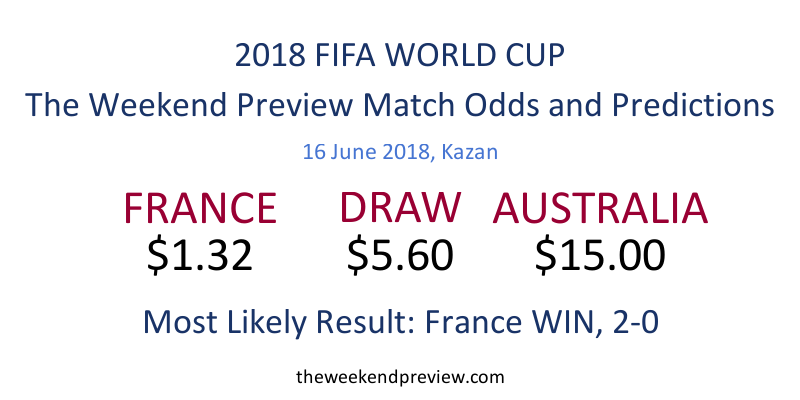 Stuck with the scenario of playing France first, what does that mean for the prospects of Australia progressing from the group? Well, first of all, if Australia do manage to get a draw or even a win against France, the prospects are good. Of the 12 teams to earn a draw or win against the seeded team in the first match, 10 have progressed to the Second Round. The exceptions were Switzerland in 2010 (upsetting eventual champions Spain 1-0) and Belgium in 1998 (drawing 0-0 with the Netherlands). But as has already been discussed, Australia’s record against the best team in a group is poor and they are heavy underdogs to even get a draw against France. So what does a loss mean? It means that Australia will need to play catch-up and forces their second match against Denmark into a must-win encounter. And if Denmark win their first match, they will also have the strategic upper hand knowing that Australia need the 3-points and have to come at them. And in the last 5 World Cups (32-team format), only 5 of 28 teams (18%) have progressed to the Second Round after losing to the top seeded team in their group. There is also the goal difference concern. The last time Australia played the top seeded team in their first game was against Germany in 2010. On that occasion, Australia was on the wrong end of a 4-0 thumping. The score line in the end proved to be crucial, as Australia missed out on progressing from the group on goal difference only. So aside from them finding a new way to self implode, France's star-studded line-up across each line of the team will likely be too much for Australia to handle. 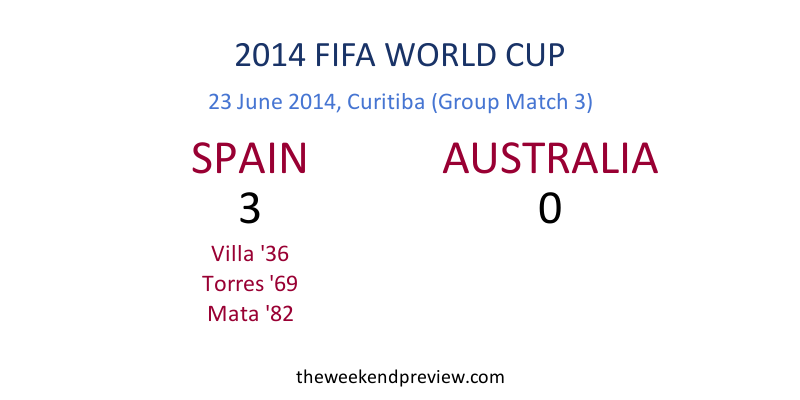 But for Australia’s sake, let’s just hope it is not another 4-0 score line.